Sea Lions: Trap, Shoot, do Nothing? The idiot who shot six trapped sea lions near Bonneville Dam has unwittingly thrown an interesting light on the plight of our salmon. Killing the sea lions will save exactly zero salmon. And anyone who would commit such an act cannot truly care about salmon survival, only about how many salmon will end up in his freezer this season. On the other hand, trapping the sea lions probably was not going to save that many fish either, unless we were going to trap them by the hundreds. The point is that if we have come to the point where our best idea for saving our salmon is to blame it on sea lions, it is already far too late. Perhaps the good vigilante who shot these federally protected animals will be emboldened by his success and decide to blow up the four dams on the lower Snake River. That way all those salmon he saved by shooting the sea lions would have a place to go. In response to Lily Witham's letter, which argued, "It's extremely cruel to take wild aquatic animals and incarcerate them in zoos" and marine parks, yes, sea lions do not need to be incarcerated, but they should not be allowed to have open season on salmon. I believe that the only solution -- humane, responsible and smart -- would be to trap the sea lions and set them free back in the ocean. Sea lions do have the right to fish -- out in the ocean where they belong. The California and Oregon sea lions don't have the right, or belong up on the Columbia River. 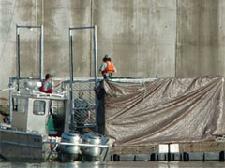 They're feeding off of not only the salmon and steelhead, but also the sturgeon; some of the sturgeon are decades old. Sport fishermen do get their catch, but at a price. They have to buy a license and harvest tag every year that limits just how many salmon and steelhead they can keep; all of the money goes back into preserving the wildlife. How are these sea lions helping? By becoming a bigger threat than they ever have been. Are we going to leave them alone until the fishery is struggling to survive? I think we're doing the right thing by removing them at any cost. If sea lions are taking 4 percent of 100,000 fish as your May 5 article states ("Sea lions apparently shot while in traps"), this amounts to only 4,000 fish eaten per year. Humans have abused and exploited Pacific Northwest salmon runs for decades -- almost to extinction. It's a wonder any are left. About 77,000 salmon died in the Klamath River when Vice President Cheney and others in the Bush administration decided to cut off sufficient water for spawning salmon for this river system. These fish were destined to lay millions of eggs for the future generations of salmon in the Klamath Basin. Now sea lions are being killed for doing what nature intended. There were no penalties meted out on the Bush administration for its politically motivated, nonscientific, destructive decisions regarding salmon.